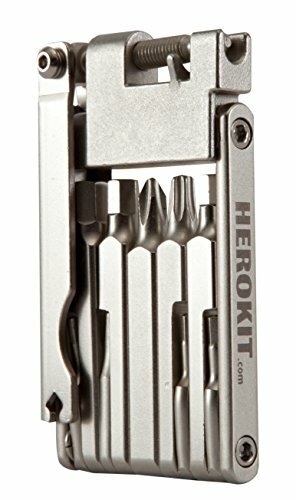 Cycling Multitool 12 in 1 by Hero Kit - Slim and Lightweight for Road and Mountain Bikes - No Rust Durable Stainless Steel - Carry Confidence by Hero Kit at Kerinci. MPN: 13-TOOL-001. Hurry! Limited time offer. Offer valid only while supplies last. Have you ever been stuck on the side of the road or trail only to discover your multitool doesn't have the tools you need or it's hard to use? Have you ever been stuck on the side of the road or trail only to discover your multitool doesn't have the tools you need or it's hard to use? Whether you're a pro, commuter, or recreational rider we have you covered, with Hero Kit you'll Carry Confidence! Buy the Hero Kit Bike Tool 12 in 1 and SAVE YOUR DAY! Great for tightening and adjusting handlebars, stem, seatpost, chainring bolts, disk brakes, derailleurs and spokes. Integrated and easy to use chain tool so you are never left stranded. This tool fits easily in a pocket and has what you need for the most common repairs on a ride. SLIM, LIGHTWEIGHT AND COMPACT bicycle tool kit. Only 2.8 inches long,1.7 inches wide & lightweight at 5 oz. TIGHTEN BOLTS AND SPOKES SAFELY: Includes a durable chain tool, size 2, 2.5, 3, 4, 5, and 6 allen wrenches, 2 spoke wrenches, T25 Torx bit, and both phillips and flathead screwdrivers. YOU WILL NOT BE LEFT STRANDED: Chains can break leaving you stranded. The Hero Kit bike tool comes with a durable and integrated chain tool. TESTED TO ENSURE QUALITY AND DURABILITY: Stainless steel for high strength and durability. Stainless steel does not readily corrode, rust or stain with water as ordinary steel does.Used by professionals and recreational cyclists alike this tool has been put to the test! If you have any questions about this product by Hero Kit, contact us by completing and submitting the form below. If you are looking for a specif part number, please include it with your message.